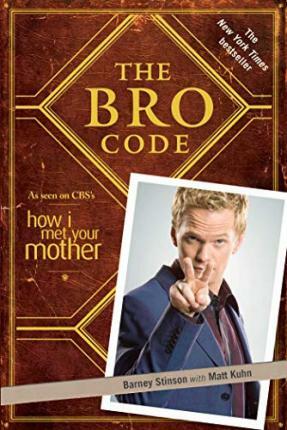 From the hit TV show How I Met Your Mother comes Barney Stinson's words of wit, wisdom, and awesomeness, The Bro Code--the New York Times bestseller (really!) with more than a million copies in print all around the world. Everyone's life is governed by an internal code of conduct. Some call it morality. Others call it religion. But Bros in the know call this Holy Grail The Bro Code. The Bro Code is a living document, much like the Constitution. Except instead of outlining a government, or the Bill of Rights, or anything even resembling laws, The Bro Code provides men with all the rules they need to know in order to become a "bro" and behave properly among other bros. Historically a spoken tradition passed from one generation to the next and dating back to the American Revolution, the official code of conduct for Bros appears here in its published form for the first time ever. By upholding the tenets of this sacred and legendary document, any dude can learn to achieve Bro-dom. Containing approximately 150 "unspoken" rules, this code of conduct for bros can range from the simple (bros before hos) to the complex (the hot-to-crazy ratio, complete with bar graphs and charts). With helpful sidebros The Bro Code will help any ordinary guy become the best bro he can be. Let ultimate bro and coauthor Barney Stinson and his book, The Bro Code share their wisdom, lest you be caught making eye contact in a devil's three-way (two dudes, duh). Barney Stinson is an awesome dude who lives in New York City and appears weekly on the hit CBS show How I Met Your Mother. Matt Kuhn is one of the coolest staff writers for How I Met Your Mother and helps write Barney's Blog on the show's website. He lives in Los Angeles, California.